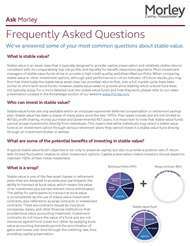 Check out our pieces for stable value basics and answers to popular questions. A new report released today by CREATE-Research and commissioned by Principal Global Investors and the Principal Financial Group® explores both product-based and guidance-based solutions to address gaps in the U.S. retirement system. Have questions about terms used in stable value? The Stable Value Investment Association offers a comprehensive glossary.